No doubt, attitude has a very important and significant place in social science. This is the reason why psychologists, educationists, administrators, sociologists have been trying to measure attitudes. It has always been always very difficult to measure attitude due to its intimate nature, yet different efforts from time to time have been made by the psychologists. It is clear from the observation of history that efforts of evaluation of attitudes are comparatively novel. Approximately six decades back the techniques to evaluate attitude in a specific manner could be developed. Earlier unsophisticated techniques like observation and interviews were used to measure the attitude. In 1927 Thurston rendered the law of Comparative Judgment. This law paved the way to measure attitudes in a systematic way and many psychological scaling methods were developed on the basis of this law which are used to measure attitude even today. In the first two methods, the attitude is measured through the behavior of daily routine of a person therefore these two are called Behavioral Techniques or Direct Method. It is clear that in these techniques, the attitude is known by directly asking questions or by directly observing the behavior of a person. These methods are very easy, but have their own limitations. The third method of measuring attitude is called psychological technique or indirect method. In this method, the attitude of a person is measured through scaling on the psychological continuum. Scaling has different methods. In the following chapter the behavioral methods are explained in brief but psychological methods are explained in detail. Direct Questions are asked in this method to a person to know his attitude about anything or person. On the basis of his answers, the information about his attitude is collected. The logical conception of this method is that if we want to know the opinions of others on any object or person, the best way is to ask questions. Direct questioning is actually very satisfying for the fulfillment of some objectives. By applying this method it is possible to categorize people in three categories on the basis of their attitude, (i) those who have favorable attitude, (ii) those who have unfavorable attitude and (iii) those who say that they are not able to form any clear opinion about attitudes. For example, if you are asked in a national survey about your attitude towards reservation for backward classes recommended by Mandal Commission? So it means that the interviewer is trying to categorize you in one of the three above mentioned categories with the help of Direct Questioning Method. If you show your acceptance or liking for the reservation then you will be categorized in the category of favorable attitude, if you show your dissatisfaction or disliking for reservation then you will be in the category of unfavorable attitude and if you are hesitating in giving your opinions or if your opinions are vague then you will be included in the indefinite category of attitude about reservation. Direct Questioning Method is not a scientific method to know about attitude. Although attitude of maximum number of person can be known in a short period of time through this method, this method is very easy and even an untrained person can also use this method successfully, yet there are some limitations also. First, a number of people hesitate to express their opinions, feelings or attitudes publicly, and are not interested to express their feelings due to social discrimination and pressure. The correct measurement of attitude can only be possible with this method when social environment is free from several kind of pressures and a person is ready to share his opinions in a right manner, for example there are several such people, who have a positive attitude towards sati pratha, dowry system and untouchability, but due to social fear and desirability they protest against these practices, but in actual, they behave in favor of these practices. In relation to these practices if people are asked for their opinions through secret voting, then probably the traditional followers will vote in favor, while these types of people will either be indefinite or will vote against these practices. It is clear that in Direct Questioning method a person can hesitate in giving his actual opinion due to different social reasons and this is the reason why the results received from these methods are less reliable. The second drawback of Direct Questioning method is its reliability. Sometime a person is confused about his opinions and they are unknown about reality of thing or people, and in a momentary excitement, they show their opinions which are different from their actual attitude. In many studies ample difference has been found between the shown attitude of a person and the actual attitude. In the Direct Observation Method the attitude of a person is known through the observation of his behavior. According to this method the attitude of a person can be known through his daily behavior about anything, person or organization. According to this method also the attitude of a person can be categorized in three categories-favorable attitude, unfavorable attitude and indefinite attitude. As the person who is being observed does not know that he is being observed and he shows his actual behavior, Direct Observation Method is more appropriate than Direct Questioning Method. For example, if a person does not accept a meal prepared by scheduled caste person, does not take part in his social functions or does not respect him and does not allow him to enter his house, then it can be concluded that person has an unfavorable attitude for schedule caste. Undoubtedly the Direct Observation Method is more appropriate than Direct Questioning Method, but it also has many limitations. First, observation of many people is difficult and also needs extra time. For example, if we want to know about the attitude of people of whole India towards presidential system then it will not only be difficult but next to impossible to measure their attitude through Direct Observation method. Second, a person generally hides his actual but undesirable behaviors due to some social reasons. For example, an alcoholic secretly drink daily, but always oppose alcoholism. On the other hand a person actually having a negative attitude for alcoholism becomes helpless to social demand to arrange drinks for a party in his house. On the same way a person having negative attitude about films can go to see a film in the pressure of his friends and a person having positive attitude for dowry talks against dowry system due to social pressures and legal restrictions. So it is clear that this is not compulsory that there should be a relation between direct behavior and real attitude. It is clear from above study that the results from Direct Questioning and Direct Observation Method are less reliable and legal, so the psychologists have discovered some more reliable attitude measurement methods. These methods also include measurement methods, which will be discussed in detail ahead. It is clear that all the possible values and positions are available in an organized sequence for psychological trait in psychological continuum. Normally psychological continuum is expressed through a straight line of which both the ends indicate minimum and maximum values of related psychological trait or two opposites poles of a trait. Psychological trait which is convertible into continuum is definitely of a continuous nature, it means that in between two points or measures based on continuum, no matter how near they are to each other, a third point or measure is possible, theoretically. Sometimes, practically some limited points or measures are imagines on psychological continuum, but theoretically it is totally continuous. When a psychological continuum is divided in numerical units so that it can be use to scale psychological traits of some person or thing, then it is called psychological scale. In other words psychological scale is actually a division of psychological continuum in numerical units, which is used to measure a specific trait. The methods to prepare this type of scale are called psychological scaling procedures. Therefore scaling means arranging psychological stimuli on the numerical scale or continuum. In the scaling method, numerical values of different Stimuli which are also called scale values are known and they are organized in the form of scale of continuum on the basis of scale values. Only psychological continuums are used in preparing measuring scales for attitude. This is the reason why these measuring methods are also addressed by the name of psychological methods. Scaling methods can be divided in two parts on the basis of their nature—(i) Scaled statement methods and (ii) scaled response methods. In both the methods for scaling attitude some statements are used. These statements express some things about anything, person or place, of which the attitude is to be scaled. The attitude is scaled on the basis of response given on these statements by the person. 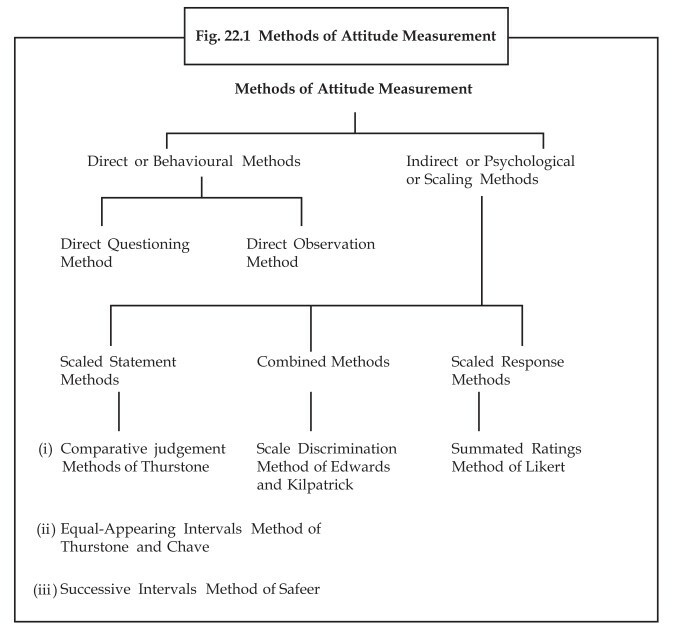 In scaled statement method the statements are scaled on the psychological continuum of attitude with the help of experts, and it is assumed that different statements denote attitude in different values. Some examples of scaled statements are given in Table 22.1. With the observation of these statements, the idea of scaled statements will be clear. On the opposite of scaled statement method, in the scaled response methods, the responses given on different statements are scaled on psychological continuum. It is assumed in this method that through all the statements included in attitude scale represent attitude of the same values, but the intensity of different responses on different statements may differ. 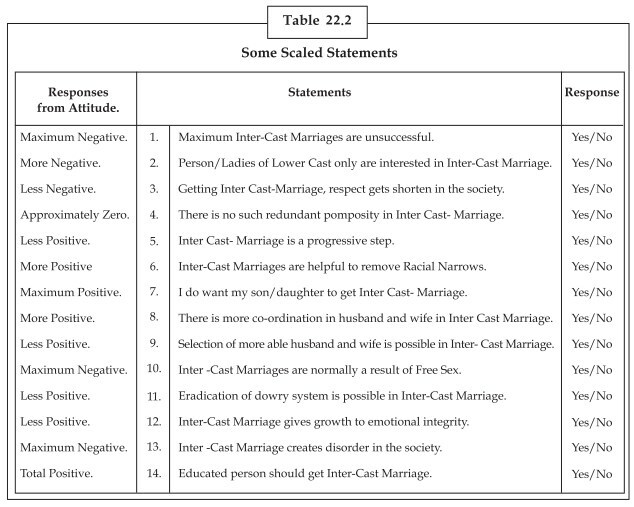 Some example of attitude statements about scaled responses is given in Table 22.2. We hope that the readers will understand the difference between scaled statement and scaled response by understanding the scaling response method. In the present, usually attitude scales are used to measure attitude. Attitude scale , is actually an measurement instrument which is prepared by following any one of scaled methods to scale attitude, by applying this the quantities of the attitudes can be measured. A formal collection of attitude statements is called attitude scale. The exercisable express their response on the statements of attitude scale, their response is converted in a numerical form by scoring them with points and this point indicates the quantity of Attitude. As discussed earlier, that scaled methods can be divided into two parts. In scaled statement method, the statements represent attitudes in different quantity, while in scaled response method the intensity of response statements differs. 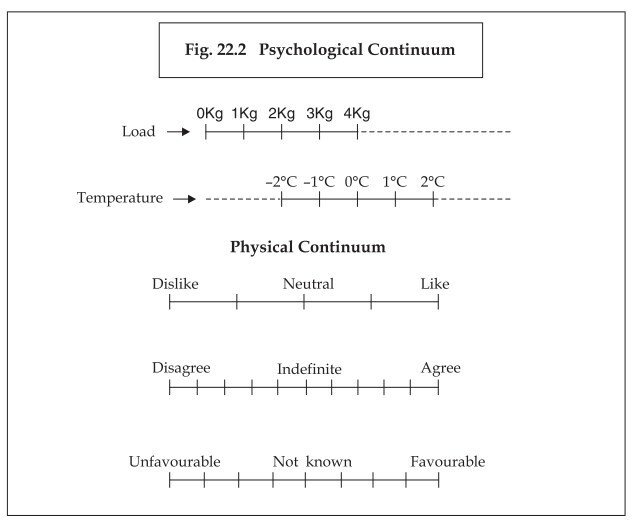 By using and discussing both these methods different, psychologists and psychometrics created attitude scales. Comparative judgment method of Thurston, equal appearing intervals methods of Thurston and Chave, and successive interval method of Safer are mainly most useable scaled statements methods. 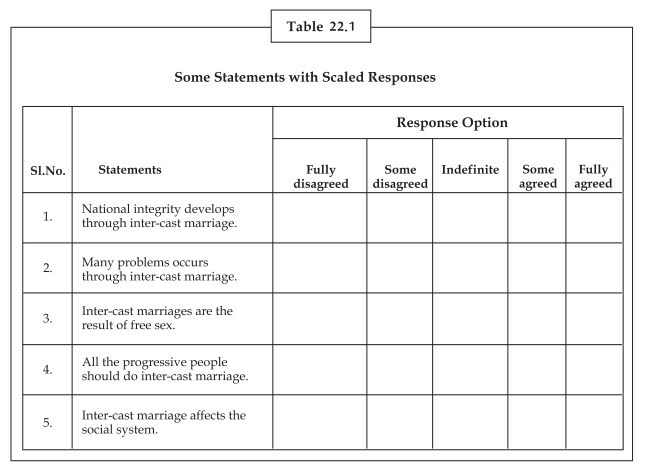 In these methods, different techniques are used for measuring the attitudes by the scale values of the statements. The summated rating method of Likert is the most popular in scaled response methods. In this method many options (commonly 5 or more) are presented about the response given by the people on the statements. These options indicate attitude in different quantities. Attitude scales can be prepared through above mentioned methods for scaling attitude for different things.